Thermoplastic Road Marking paints are extensively used for marking marks on highways, streets and roads to avoid any accident. The offered paints are processed using excellent grade chemical compounds and latest techniques in strict vision of our professionals in line with the set industry standards. The quality range of Thermoplastic Road Marking Paint, which is formulated using finest chemicals. Also known as hot melt paints and traffic paints. Thermoplastic road marking Paint is a new generation highway marking system, preferred the world over. We only use thermoplastic for rumble strips, since road markings in thermoplastic are more durable and hard-wearing than conventional road paint. It is long lasting and retro reflective hot applied paint. Applicable on asphalt and concrete surface. It is use for Road, Parking and Lane Markings. 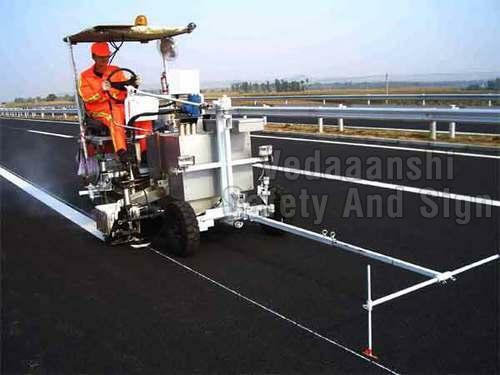 It is use for zebra crossing, Rumble strip marking, Speed Breaker Marking. These markings facilitated high visibility during day and night both which contributes effectively in instant recognizance of the lanes by vehicle drivers which further leads to smooth flow of traffic and greater safety.